There’s another conundrum to add to the numerous decisions stressed parents make every single day; take your Easter break during term time and pay the fine or take it during school holidays and pay the price? It’s an emotive debate, with some believing that the actions of many travel firms in significantly raising prices around school holidays leaves them with little choice but to pay the £60 school fine with the hope that it’ll lead to cost savings overall. 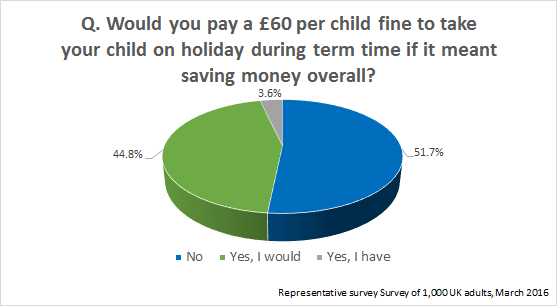 To help shed some much-needed light on the issue, we put the conundrum to a representative sample of 1,000 UK adults by asking: Would you pay a £60 per child fine to take your child on holiday during term time if it meant saving money overall? Interestingly, the survey revealed that 52% of people would not choose to pay the £60 fine to take their children out of school for a holiday, even if it meant saving money overall. It’s a close call though as nearly 45% would do so and nearly 4%– or one in every 25 adults – already has. Men are more likely to take the fine on the chin – 9 in 10 of those who confess to already having taken their child out of school during term time are men! More detailed analysis of the results also reveals some interesting differences across the UK. Parents in England were the most willing to pay the fine and take their children on holiday (46%) and parents in Scotland the least (31%). Parents in Northern Ireland were also the most likely to admit to having already paid the fine.